Experience has taught me that I shouldn't talk about modern trends be it in music, fashion, hobbies or sports. Why? Well, I simply get too old for that. I am only 44 but there are things I am not prepared to understand just because I was born and raised in the 60s. Gosh, ancient history now! There are specially a couple of posts I sadly remember too well, one was about a jacket with a logo that read "social distortion" and the other was about "ska". I won't bring the issue back though. It was just an example of how can a middle-aged man screw things up when it comes to young people's stuff. This elusive preface will be my alibi to tiptoe over today's picture: Skateboarding in Barcelona. The only thing I can tell you for sure is that the photograph was taken at the beach in Barcelona. 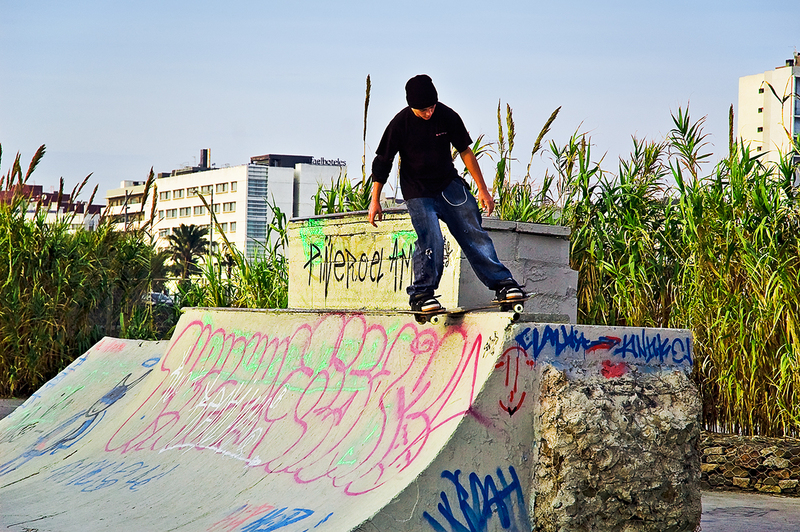 Skateboarding in Barcelona is great country, with the scenery and weather no skateboarder can resist its beauty. Skating their ways through the streets and alleys. Ok I'll accept that, hope everything goes swell with the skateboarding site.